We have been talking about content views in the previous posts, but to be sure we are all on the same page: a content view is a versioned, filtered set of repositories that you can promote between lifecycle environments. We have been talking about 'normal' content views, or CV, up until now, but Satellite 6 also knows the concept of a composite content view, or CCV. A composite content view allows you to bundle other content views, rather than individual repositories. The best approach to this is to start creating re-usable building blocks (component content views) to bundle in CCVs. You could, for example, create a building block for the base operating system, and combine that with different application content views into composite content views. 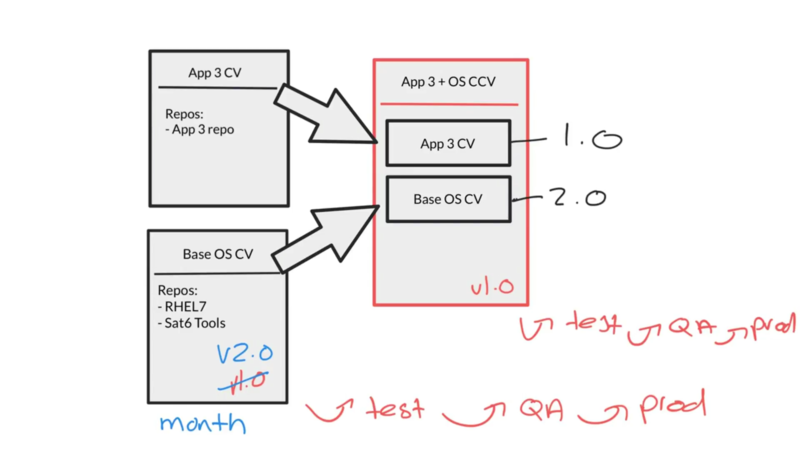 You might want to do this if your application content views follow different lifecycle paths, or move slower (or faster) than your base operating system content view through the same lifecycle path. Another use case would be if the application content view is maintained by a different department. By using composite content views in that case, the team of application administrators or developers can manage the application content view, and the Linux administrator team can manage the base operating system content view. Every once in a while - depending on requirements - the two component CVs are bundled together into a CCV, and then published and promoted. Hope you enjoy the video! Please subscribe and leave any comments here, or on YouTube, whichever you prefer!